The Kundel trench box uses a patented design that decreases weight while increasing strength and profitability. They have been built by the Kundel family for over 20 years. They incorporate continues welds as apposed to the stich welding you will find on other trench boxes. Kundel’s steel Titan and Basic 3 trench boxes utilize internal shelving to add strength, decrease weight, and give the worker a place to store tools. The Kundel company has enjoyed a rich history of producing innovative and quality trench boxes now for over 20 years. Kundel began when Robert Kundel Sr. was a contractor in North East Ohio. There, he noticed the need to have a better built box. As a result, he began manufacturing trench boxes for his own use. As he began producing these trench shields, he soon found out that other contractors and municipalities appreciated the Kundel design features as much as he did. Today Kundel is one of the leading U.S. manufacturers of both trench boxes and trench shoring equipment. Most importantly, each Kundel trench box is designed with safety and productivity in mind. All of our models are P.E. Certified and meet or exceed OSHA requirements. In addition to the basic trench shield products, Iron Lot has hundreds of possible trench shielding and trench shoring options to choose from. For over 10 years Iron Lot has been offering great products at great prices to customers around the globe. Iron Lot will match your job requirements and excavator capacity to the best trench shield in the industry – THE KUNDEL TRENCH BOX. The Kundel Trench Box will Save Lives and Increase Productivity – Order the Better Built Box Today!!! 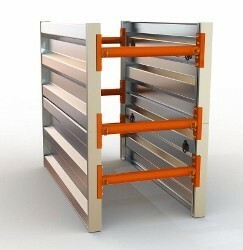 Kundel Aluminum Trench Boxes and trench shoring equipment are lightweight, compact, and strong. We have trench boxes that can easily be assembled by two men and transported in a standard pickup truck. 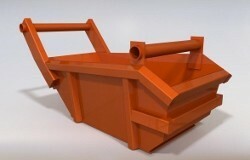 These trench boxes are perfect for municipalities, plumbers, and those doing small spot repairs. 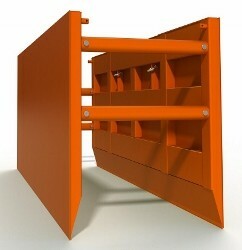 Kundel Steel Trench Boxes are designed with some unique features that are not found in other trench boxes. Internal shelving is only found in the Kundel engineered trench boxes. Not only does it strengthen the trench box while making it lighter, it is also a convenient design feature. These Trench boxes do not have wood or foam filler. When you tamp the pounding pad the force is transferred to the cutting edge, it is not deadened by a block of wood or internal cross members. The Kundel Stone / Bedding Boxes that we sell are designed to serve the needs of the contractor. Kundel has reinforced the areas of the box that the excavator bucket is likely to come in contact with. The loading edge has been tapered at a 90 degree angle. This allows the stone to fall back into the excavator bucket rather then spill on the ground. This bedding box is built to last.